Below is the last page of penalty assessments for "Prohibited Transactions" charged against the Watauga County Republican Party by the North Carolina Board of Elections. The total fine tops $14,000. This last page follows three pages of listings of donors to the party who gave cash in excess of $50, which is prohibited by law. Nathan Miller gave $500 in cash. Four Eggers gave $300. The Party collected over $1,100 in cash at their Christmas Party in 2013 (and immediately paid most of it out in expenses for the party, according to the page below). This last page shows cash disbursements, including a large one to the North Carolina Republican Party in 2014 (was that cash contribution listed by the NCGOP on its 2014 party filings?) and another large cash expense ($1,160.32) to an "Unknown Receipt Source." 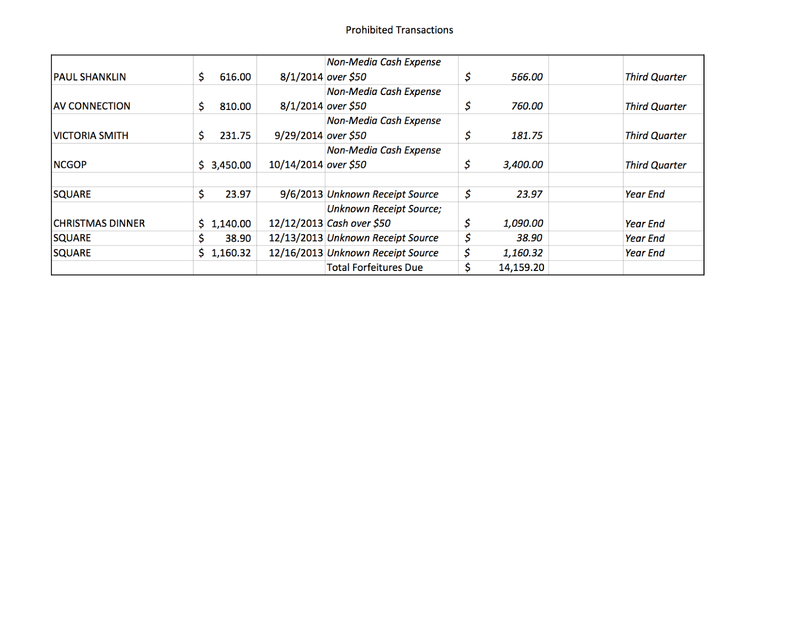 Anne Marie Yates, who is still Watauga GOP Chair, presided over many of these transactions. The man who is now running Watauga elections -- BOE elections director Matt Snyder -- presided as GOP Chair over some earlier "prohibited transactions." I'm sure their lawyer said it was all okay at the time. 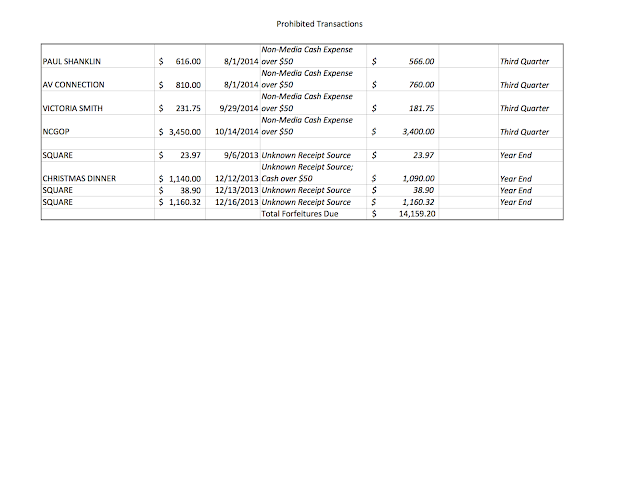 Four Eggers obviously offers very expensive legal advice to NCGOP - and to the county, with costs well beyond his fees.